New DNA technologies are rapidly being developed and will have an increasing impact on the world and on people’s daily life. Future Genomics Technologies aims to translate academic knowledge and novel technologies into usable applications and provide early and easy access to these applications. Our mission is to help you achieve your goals using cutting edge sequencing and bioinformatics technology. We are at the cutting edge of genomics technologies and our customers can benefit from the latest developments. Our expertise includes genome assembly, transcriptome profiling and the bioinformatics analysis that are needed to get access to the results of your project. With our extensive knowledge we can offer solutions that cover the whole process of going from a biological sample to a complete genome sequence and even publication. Studying gene expression can be important to understand biology. We have the knowledge to offer the right solutions that enable you to study transcriptomes in different ways, catering to your needs. With the ever-increasing amounts of sequence data, it has become more important to make this data accessible in a meaningful way. We offer solutions that will help you understand and analyze your data. Future Genomics Technologies, founded in 2017, is a collaboration between biotech company BaseClear and Leiden University. We work closely together with Oxford Nanopore Technologies and use their revolutionary nanopore sequencing platforms to develop new genomics applications. 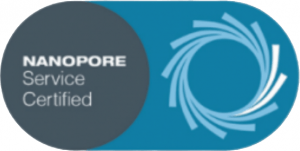 We are one of the world’s first Oxford Nanopore Technologies certified sequencing providers. Our customers include biotechnological and (bio)pharmaceutical companies, academic and research institutes, as well as agro- and food industries. Future Genomics Technologies uses the latest Next Generation sequencing technologies, including those of Oxford Nanopore Technologies and Illumina. Next generation sequencing has completely revolutionized the way in which complex genetic information is being unraveled.